My absolute favorite part of the insert! 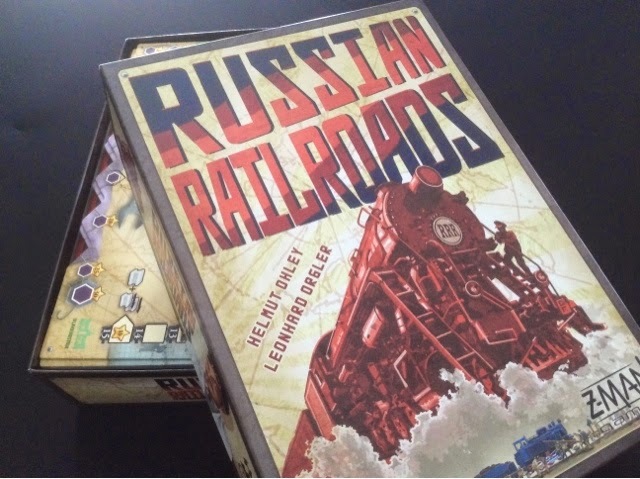 I too very much enjoy Russian Railroads. Probably not as much as Eric but I give it mad props for its quick playtime and engaging gameplay. The one big issue I have with RR is the setup and tear down of the game when it comes to the level 2-9 locomotives. 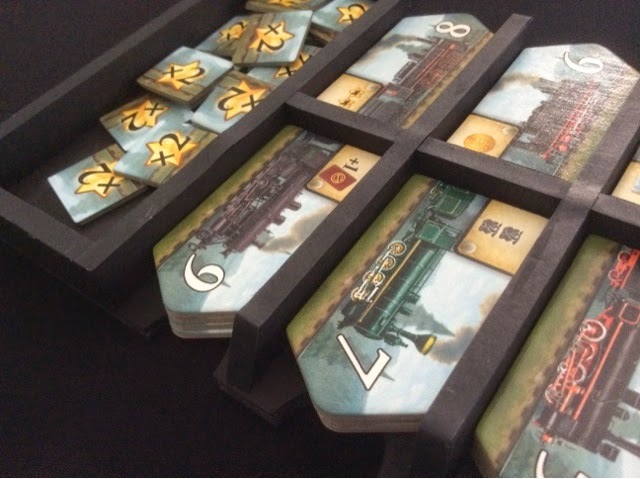 For a quick playing game, the sorting of the 8 locomotive stacks were a great pain for me. Storing them in the original insert was messy, and setting up, arranging, and subsequently splitting them into the various stacks once done was annoying me. So this insert really helped to solve quite a bit of this problem I had. Firstly, storing them was neat and beautiful looking. Secondly, setup once stored is quickly solved not just because they were nicely sorted already, but it also helps in the arrangement whereby you could easily see when a stack is depleted. The only problem that wasn't fixed was the sorting of stacks once the game is done. That is still an ongoing thing, but ticking off 2 out of 3 is more than sufficient for me. A close up. See the nice finger tab to lift the tiles? Like! 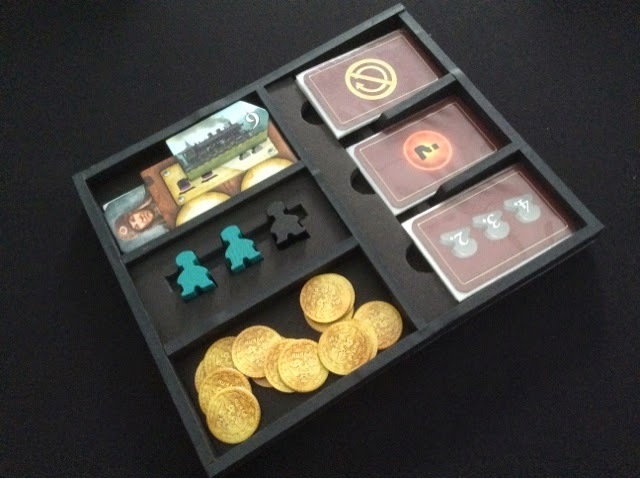 The second tray doubles not only as storage but also as a convenient holder for the remaining game components. 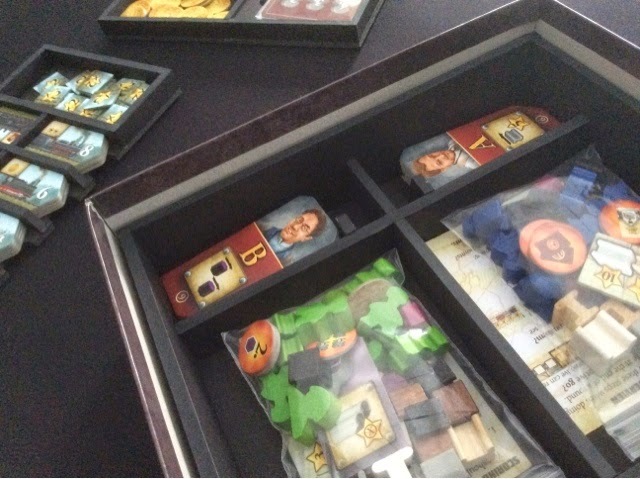 On this tray players will find the coins, the end game bonus cards, and the special one time use cards. 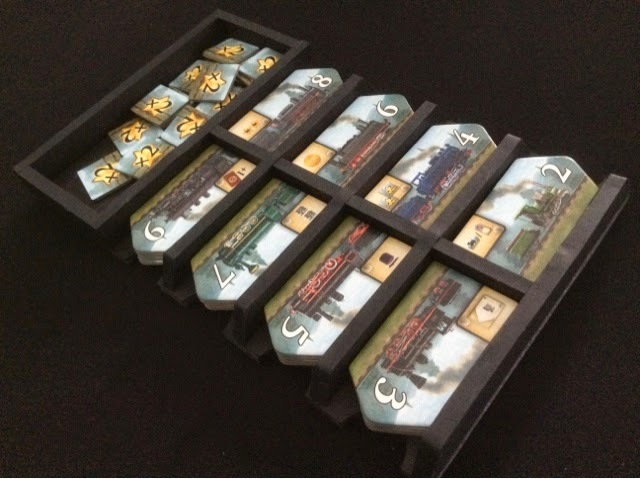 The tray also has an area for the special engineer and locomotive tile and also the spare non player specific meeples. 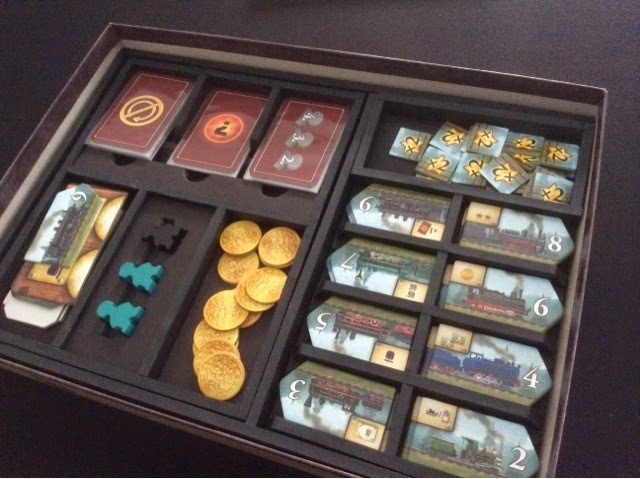 I just love the detail in the tray, like how the cards have a nice slant so that it won't fall out accidentally, and how you can easily put you finger in to lift the cards out. 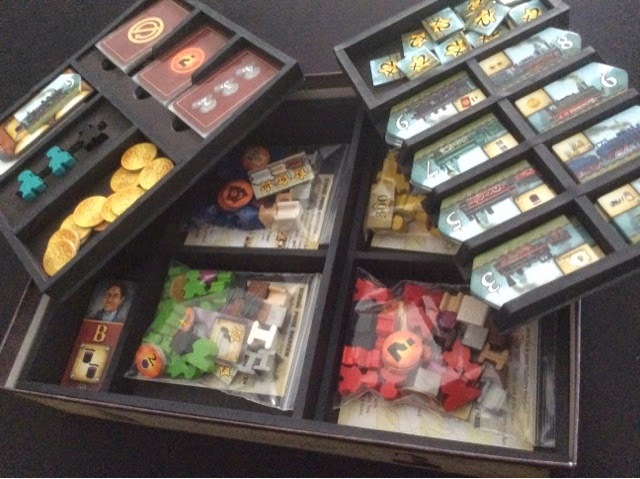 Base of the insert. Hello engineers! Lastly, the base of the insert is where the engineers go. They can easily be separated into stack A and stack B. Notice how there is a small tab on the top to hold them in place? And the engineers look slanted because they are - on purpose. The top tab is shorter than the length of the tile so that you can lift the engineers out effortlessly. Your finger will reach to the bottom of the stack due to the slant. Nice! Just one, but it is a BIG one. In fact, it might take awhile to get posted. Collecting all the photos is going to be tedious and I just haven't had the time to do so recently. But hopefully soon! We'll see! I think I would rather keep that under wraps in case he has different plans for insert pricing. I did get a few so it could have been cheaper, no idea. Understood. If only I can learn how he makes those clean cuts and angled cuts. Haha thanks anyway! I am glad you like it so much Jon!